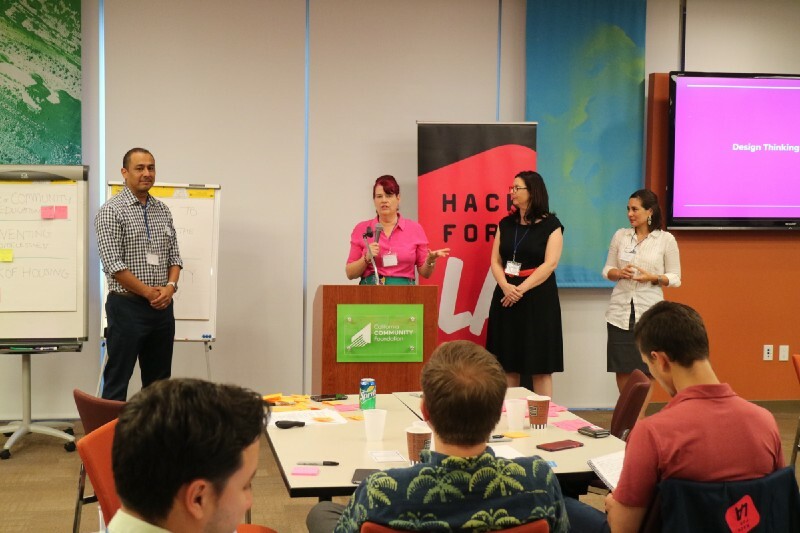 Every year, Code for America volunteer brigades around the country celebrate a day devoted to civic hacking. Teams nationwide come up with ways to give back to their communities and aim to motivate others to join the cause. 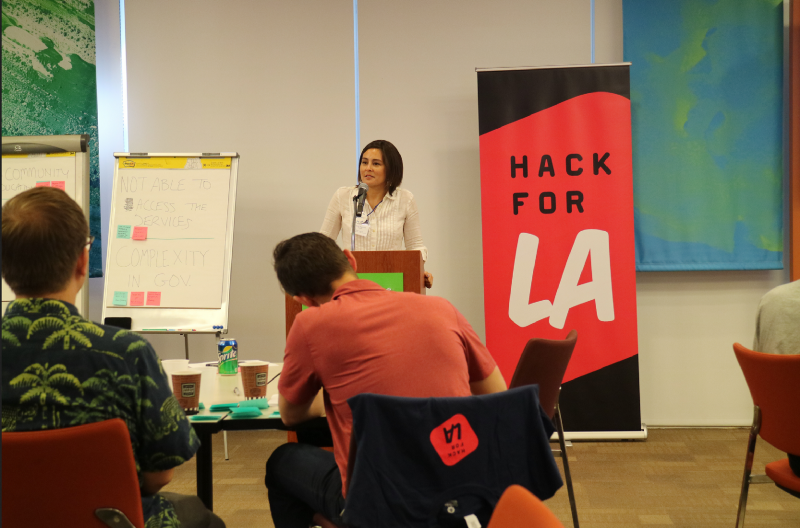 In the past, Hack for LA teams have come up with apps that help people find jobs, serve specific neighborhoods and help do intake for Safe Parking LA. But this year, we tried something different. We decided to focus our National Day of Civic Hacking on empathy. Given that homelessness in Los Angeles has increased 75% in the last six years, we know it’s an important issue full of opportunities. We built our schedule around hearing from local government agencies, nonprofits and advocates. As we heard from the experts, we processed what we were hearing using design thinking exercises. At the end of the day, everyone walked away with a specific problem they could help solve and a deeper understanding of the root cause of the problem. Start with one problem. Start with just your neighborhood. Start with listening. 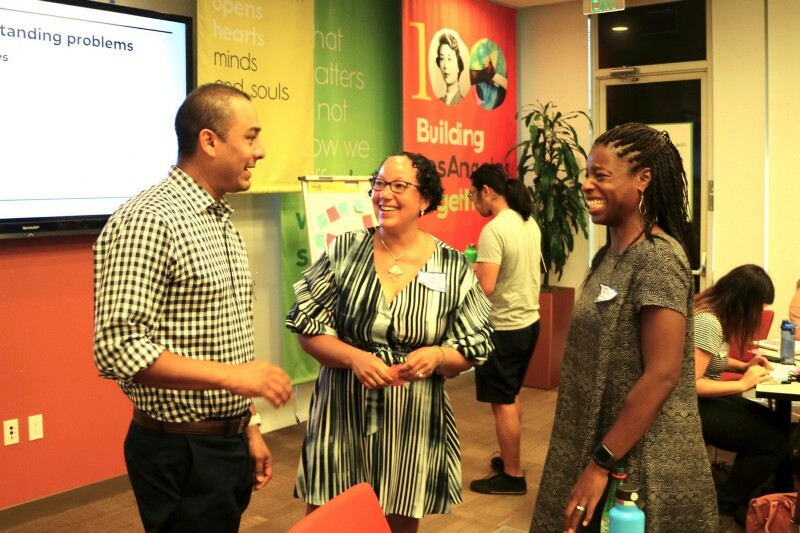 Our goal was to help civic technologists build the necessary listening skills to create effective solutions. Far too often, we jump into solving everything with an app. Real solutions rely on us getting more involved in the problem space, truly understanding the nuances and creating a solution with the community rather than for the community. For those of you unfamiliar with the housing and homelessness field, this was an all-star lineup of speakers. The individuals and organizations mentioned above represent a significant portion of the entities working to end homelessness in LA. It was a roller coaster of emotions listening to these experts tell us their struggles with complex government relationships, local and national policy, and of course, the daily one-on-one interactions with people in need. In attendance, we also had some impressive representatives from key organizations including Inner City Law/Homeful.la, Invisible People, the City of LA, the City of Santa Monica and the Mayor’s Office. 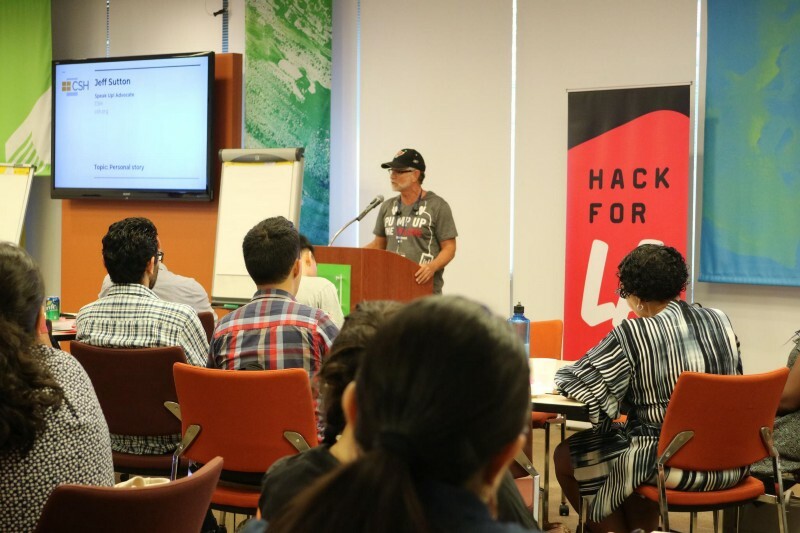 Along with experts from the field, we had many technologists and Hack for LA regulars join us. As you see from the agenda above, we did two sessions of lightning talks, each followed by a workshop. In these workshops, the objective was to stay completely in the problem space. Asking as many questions as possible but not providing any answers yet. The first workshop was problem generation. We asked everyone to write themes from the talks on post-it notes and then, we grouped them by common traits. 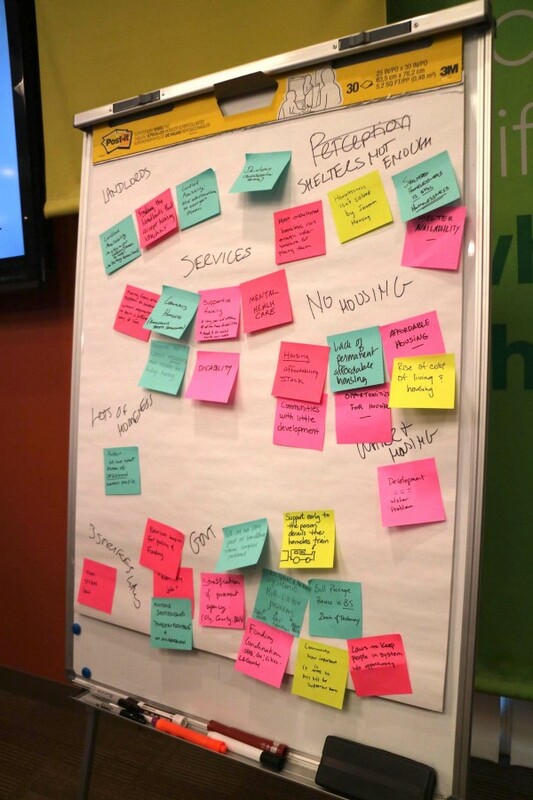 By the end of this exercise, we had hundreds of post-its and over twenty problem areas. After we had exhausted our problem set, we talked through what we thought the highest value problems were to solve. If we solved one of these, which would save the most lives? Help the most people? Save the most money? We asked the audience to vote by raising their hands though in a smaller group, this prioritization is often done with dot stickers. Need for community education - Community support is necessary to provide housing, shelters and services. When there are misunderstandings about what causes homelessness or what the solutions look like, it can block action. Preventing homelessness - It’s easier to help someone stabilize before they become homeless than when they are already experiencing homelessness. Currently, there are a substantial amount of Angelenos on the brink of homelessness with very few resources (or knowledge of resources). Not able to access services in real time - When someone is ready to accept services like medical or mental health support, it’s difficult and time-consuming for their Case Managers to find an available spot in a program that matches their needs. Feeling motivated to jump in yet? Why is it so hard to find a match? Because each service has specific requirements and there are not enough openings. As technologists, we may not be able to solve the problem of enough services being available but we could alleviate the third and fourth level problems here. We could work on helping Case Managers reduce the amount of time they spend finding a program opening that’s a good match. This was a pain point we heard from speaker Dorit Dowler-Guerrero who is an experienced Case Manager. Articulating clear problem statements such as the one above helped us develop our thinking about those experiencing the biggest pain from each particular problem. Deeply understanding the person you are solving for is the most critical part of developing a successful solution. With our problem statement, we talked through who is most impacted by the problem, what their day is like and what’s blocking solutions for them. Then, we talked about the opportunity. What would be possible if this problem was solved? The opportunity statement is the start of a solution. At the end of the day, everyone took home a packet with a clear problem statement, a sense of who has that problem, and a framed opportunity that they could work on. The goal is for participants to join us at Hack for LA hack nights and start project teams around some of these problem spaces. Far too often, we jump into solving everything with an app. Real solutions rely on us getting more involved in the problem space, truly understanding the nuances and creating a solution with the community rather than for the community. Some of the above ideas are bigger than others and regardless, we’d recommend talking with government agencies or nonprofits working in these areas before starting work. We included a list at the end of the post. 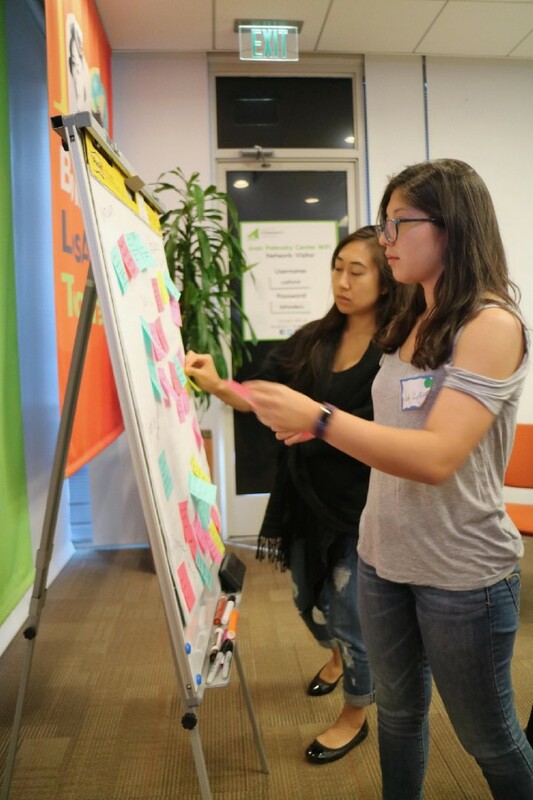 You can also join us at hack night and we can help you shape your idea. However you begin, the possibilities are endless and it all starts with you. This article was reposted with permission from Hack for LA's Medium Publication.